A Special Thanks to Our Friends at Wisconsin Cheese and Schlafly Beer! We have recently had two "Guest Chef" Classes here at Eckert's in our Classroom. The first was held on March 21 and was the Wisconsin Cheese and Schlafly Beer Pairings. Sarah Hill from The Wisconsin Milk Marketing Board was one of our guest speakers and gave our guests a glimpse into the world of Wisconsin Cheese! Sarah Hill is in the chees e business and has more than 25 years of experience under her belt. She attended the Culinary Institute of America in Hyde Park where she got the opportunity to work in kitchens all across the country. Sara is currently a board member of the American Cheese Socitey and serves the Wisconsin Milk Marketing Board as Culinary Manager of Cheese Education. Sara served up some of her most delicious cheeses to be paired along side of the fine products of Schlafly Beer. Ben Broker from Schlafly Brewing discussed the fine art of concocting the perfect brew. Beer is the new wine of the U.S. Artisan Cheesemakers and Brewmasters around the country are creating wonderful products that are made for each other. Both based on the "terrior" of where they are made with full, complex flavors that make each other taste even better! Our next "Guest Chef" C lass took place on March 22nd in our classroom and was a Wisconsin Cheese Dinner. Once again Sarah Hill was our guest chef! 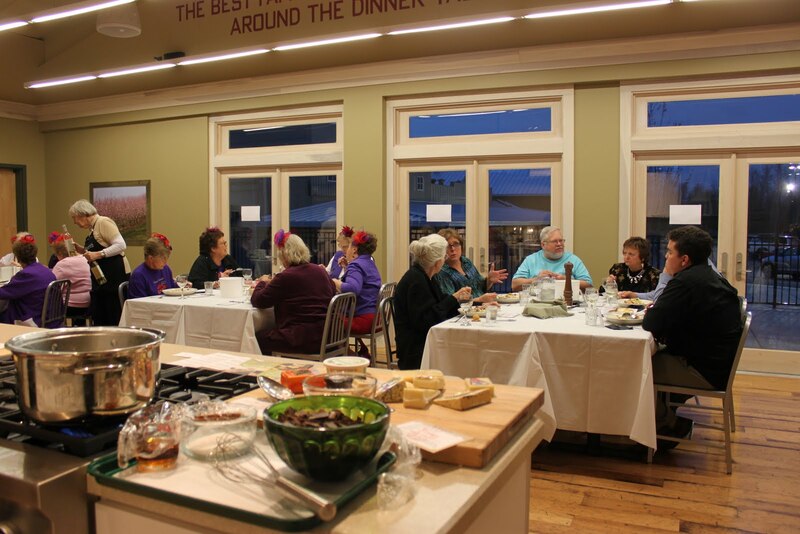 She led us through the preparation of a fantastic meal and gave our guests the opportunity to learn about great Wisconsin Cheeses and taste items prepared with several delicious cheeses. Our recipes consisted of: Cheddar olive pops, arugula salad with Blue Cheese, baked chicken breasts filled with Prosciutto and Fontina with SarVecchio Crust, bacon mac and cheese with Gruyere and finished it off with a rich Chocolate Mascarpone fondue! We had an amazing time and hope our guests did too. Thank you Sarah Hill and Ben Broker for making those evenings so delicious!